How are the Pulitzer Prizes awarded? How would you rank the Pulitzer novels? So begins A Bell for Adano by John Hersey, winner of the Pulitzer Prize for the Novel for 1945. Hersey’s approach to the novel is explicitly didactic from the beginning—prior to this opening sentence, he offers a foreword that explains his purpose in writing the novel, and it’s all the optimism and exceptionalism and spirited nationalism (maybe the best of all these impulses, to be sure) you would expect from an American writing in the flowering of the Pax Americana, a world-altering victory that would usher in a new era, and one in which the Stars and Stripes reigned supreme. That’s a lot of weight to hang on a single character in a novel before we’ve heard him speak or seen him step from his landing craft and survey the town he will inhabit. My initial criticism of this novel is that, stylistically, it proceeds to give every sign of being just that single-minded, presenting Major Joppolo in the simplest possible light and bringing in basically every other character and situation in such a way as to show both how stacked the odds are against his success and yet of course how inevitably he will succeed by dint of his sheer goodness. On the other hand, this is the sort of criticism I floated about The Bridge of San Luis Rey when it began, in moralistic fashion and aggressively foreshadowing the book’s ending, and that turned out to be a gem of a novel, one of the brighter stars in Pulitzer’s constellation. Wilder made the style work, and turned the novel’s limitations into a powerful rhetorical device that imbued each of his characters with seriousness and meaning. So who am I to say yet that Hersey will not do the same? I only express concern at the outset. The fictional Adano is allegedly based on this gorgeous Sicilian city, Licata: the panorama (courtesy of Wikipedia) is a wonderful image to carry with me as I read. Victor Joppolo is middle-aged, steady, almost too classically the picture of the stoic, determined man of justice so beloved by American popular art in the middle of the 20th century (I think of Gary Cooper here, and his many imitators), although I’ll note with satisfaction that Hersey could easily have skewed towards making him a dialect-spouting, excitable caricature of an Italian immigrant, and totally avoids it. Still, though, I find myself more drawn in the early going to the much more cynical, sharp-minded sergeant who accompanies Joppolo ashore, a Hungarian-American named Leonard Borth, who has traveled the world, it seems, and likes a good joke more than Major Joppolo. The two of them have to figure out how to control a town full of people they don’t know—half of them ex-Fascists who dream Mussolini will rise again, and the other half Italians who hated Mussolini and Fascism but hardly can be expected to trust a couple of American G.I.s to do much better. The little I know about this book suggests that the titular bell—and recovering or restoring it somehow for the town—plays a big role in that. But surely the book will have to cover more than this kind of architectural rescue mission. There’s not much more to say as yet—as is my custom, I make this first post based on only the first few pages, just to give me something to reference later (either to note happily how spot on I was, or to cringe a little at how far off my guesses flew). I approach Hersey’s novel right now, thinking that at best I’m reading a pleasant but slightly forgettable “rah rah America” story, and at worst an excessively stereotypical and pig-headed “rah rah America” story. Above the floor of the worst Pulitzers but well below the altitudes reached by the best. Time will tell. As I prepare to embark on a new Pulitzer novel—1943’s Dragon’s Teeth, by Upton Sinclair—it’s time to embark on 1943’s poetry, as well. We’ll start with a short one this week, and a poem written under unusual circumstances. Leo Marks was a young British cryptographer working on encryption as a part of the war effort: he missed the cut to get into Britain’s now-famous (then, of course, top secret and unknown) Bletchley Park code team, but found work elsewhere in the military. Marks was one of the first cryptographers to develop and use the incredibly secure one-time pad cryptographic method: I’ll leave out the details (reading about cryptography is one of my many weird habits), but the long and short of it is that one-time pad cryptography works because the code is created using an encoding document that is unique. Unique pads, though, are incredibly difficult to generate, so the British were taking a less secure shortcut: they’d have an agent memorize a poem or two, and use the poem as the key to a cipher that would ideally be very difficult to decode. The Germans, however, learned to crack those simply by looking through poetry anthologies and adopting a “trial-and-error” approach. So Marks resorted to writing his own poetry for the purpose, sending agents out into occupied Europe with original poetry of his own devising, which would force the Germans to use much slower and more complicated methods of decryption and increase the agent’s chances of operating undetected. Yet death will be but a pause. Marks writes a poem that is not initially all that complicated—simple words, almost the simplest, really. Not a word of the poem takes up more than one syllable, and there probably isn’t a word here that would be unfamiliar to a first grader. But the depth of feeling here is real, I think. At first it seems like a love poem you would write for someone still living: Marks is dedicating his life to her, he is giving himself to her. It feels like the kind of thing someone might say as a part of their wedding vows, or might whisper on bended knee as a way of preparing to ask for a wedding. The intimacy is too close, almost, for me—I feel I have opened the door on a moment no one else should witness, I am profaning somehow the sanctity of that pure love by eavesdropping like a village gossip. The poem opens itself up, I think, as some of the phrases turn out to be more complex than they appear at a distance. “The life that I have is yours” is easy enough, but what is “the love that I have of the life that I have”? Is he talking about the love in his life? The love he feels in his life or the love others feel toward him? Is it how he loves his life? And what, in any case, does it mean that this love is “yours and yours and yours”? There is something so generous about this kind of self-emptying, because it does not feel remotely self-deprecating. This isn’t the kind of sacrifice someone makes when they feel worthless. This is the kind of sacrifice we make when we discover something beyond value, something whose worth we could not begin to calculate. The third stanza is just a little too trite for me—we’ve heard other poets, better craftsmen and craftswomen, tackle the notion that death is only a sleep, that we have the hope of waking in another world, and a better. But then the fourth stanza breaks over us again with that complexity. Is “the peace of my years in the long green grass” him talking about his death, his burial in a cemetery? Or the long life he will have without her, sunny days and picnics in the park, a life lived fully and not cut short like hers was? And again, in either case, what does it mean for that peace to be “yours and yours and yours”? I feel I understand him implicitly, and I have absolutely no way of translating it directly. This is a beautiful little poem, and I don’t want to overanalyze it. It strikes me not only as a fine start to 1943, but also as a nice poem for Valentine’s Day weekend, if any of us are in the mood for talk of real love in the neighborhood of a holiday that beats us over the head with a prepackaged notion of what it looks like. Love can come from a pink card, I know—from the dozen roses and the heart-shaped box of chocolates that make their appearance on doorsteps across the nation. But it also comes from heartbreak and sorrow, from the shaking pen of a 23 year old who has lost a woman he loved and who worries he may yet lose his country, from a poem tucked inside the coat of a woman who will go to her death bravely. I hope it strikes you as the right poem to ponder this weekend; it’s certainly given me plenty to think about. The years I’m reflecting on—1940 (the year of my current Pulitzer novel) and 1941 (the year I’m now focused on for Poetry Fridays)—are momentous years for the history of human civilization. For the first time in recorded history, we really did see a world war, a war so all encompassing that virtually everyone on the planet felt some kind of impact…no offense to the Great War (World War I), which was serious and important and truly devastating, but 1940-1941 unleash a violence whose impact and breadth are really unrivaled by anything other than the four years that followed them. It will (presumably) be some years before the Pulitzers catch up and give me novels that contemplate humanity in this setting, so for now I’ll turn to poetry to capture the emotions of the opening years of World War II, starting with a poem by John Gillespie Magee, Jr. He was the child of an American Episcopal priest and a British woman, born in China, raised in England, schooled (briefly) in the United States. In 1940, he joined the Royal Canadian Air Force. In 1941, he flew in a Spitfire Squadron over the fields of Great Britain—this is during the embattled year when the United Kingdom stood alone in defense of all that the Axis powers opposed: personal freedom, tolerance, the right of any minority group to exist. He was one of the brave few to whom, Churchill said, never before in the history of the Earth had been owed so much by so many. 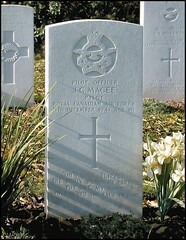 And over Lincolnshire, at the age of 19, in December 1941 John Magee was killed in a midair collision. He is buried in Lincolnshire, at peace, as Rupert Brooke (another young poet killed by a world war) might have said, “under an English heaven”. Magee captures the heart-breaking beauty of the young man at the peak of his powers—astonished at the glories present in the world, confident in his seemingly boundless capacities, exultant in the innocent wonder associated with the miracle of flight. Unlike Yeats’s Irish airman who foresaw his death in a poem of the Great War, Magee here is full of joy and optimism. His hands touch the face of God in humble gladness, in the almost careless freedom of a boy who thinks there is no height too high for him to climb. In another poet, this might easily seem self-indulgent—the overly purple prose of a teenager too giddy to focus, too silly to be serious. But the context is all-important, isn’t it? I think so, at least. The poem is resonant because it is an island of peace in what must have been a great sea of sorrow and pain. Magee is a boy who has seen other boys die, whose job it is to kill, in fact, to protect the innocent. He turns the air into a sanctuary, into a bright and tranquil avenue to the divine, in part as a reaction to the reality that, in the 20th Century, humanity learned to fill the air with death and war just as skillfully as it had turned land and sea to that end in centuries past. The poem is lovely because it is futile—a paper shield held up against the reality of what would happen to Magee, and to hundreds of young pilots like him, in defense against a foe with whom there could be no compromise. Even at my most pacifist moments, I have to admit the deep admiration I have, and the deep debt I feel I owe, to young men like Magee. This is in part because two of the young men in the skies that war were my two grandfathers—one a bomber pilot in Europe who got himself and his crew safely through their tour of duty, another a seaplane pilot in the Pacific whose job was to rescue downed sailors and liberate POW camps at the end of the war. I grew up hearing the stories they could bear to tell, and I know that there were stories each man took alone and private to the grave. I caught glimpses of that shadow at times, tears forming at the mention of a friend’s name, a smile suddenly becoming set and tense as an unspoken memory surfaced. Both men knew all that Magee did—the amazing joy of those early hours in the air, flights their own grandfathers could never have dreamed of, and then the cruelties of war, again unimagined and unimaginable by their families back home. It makes me somber as I approach a poem like this, almost reverent. The sonnet, in what it does and does not say, reminds me of the things I must not forget, about my family and my country and the world. I could say more about it as a poem, but I think I’ll leave my reflections here—it’s clearly the work of a young poet, and an amateur at that, and yet it’s a very resonant piece for me. I alluded earlier to the familiarity of the phrases: in case that was too cryptic, the first time I ever heard the phrase “slipped the surly bonds of Earth and touched the face of God” was when President Reagan told my six-year-old self (and the rest of a grieving nation) about the Challenger disaster in his address to the nation. I had watched the loss of the shuttle in real time that morning—the first memory I have of any event beyond the scope of my home and family—and the words Reagan said have always stuck with me. Poems should do this to us: live inside us all our lives, work on us when we need them to, come to our lips in fragments and phrases unbidden and maybe even unrecognized. Whether this poem does that for you is, of course, for you to say—all I can say is that it does that for me, and I suspect it always will. Hello to friends; and I have learned to drive. There’s a casual tone to the poem that I liked immediately—Millay at her worst is over-wrought and uses 16th century exclamations (like “O thou wretch!” etc.) to excess, and so the opening lines caught my eye right away as an example of the plain-spoken style she finds when she’s at her best, generally. Millay is also usually at her best when considering the two great obsessions of her life—love and death—and a blunt look at war seems to me to suit them nicely. Millay’s pacifism has already been explored briefly here at Following Pulitzer, but I wondered how it would sound when dealing with the specific world of 1939, and not the abstraction of war as defined by a dictionary. The ambiguity in her phrases is one of the things I love about her—the number of senses I can make of the line “War is a way of living” is a good example. Whether Millay is talking about the city’s acceptance of war as the new reality, or about how the nations seem to have accepted war as the way to survive, or about how human beings can adopt a warlike attitude as a way of getting through their day…any and all of these add something to the poem for me. I am intrigued by what it means to “make a home of it”, “it” seeming to mean “death”—is this about accepting the imminence of death? Something like a stage in the grieving process for the person about to die? Or am I missing something there? I wonder. The temporary nature of this city—a place not to stay but to “stop in”—reminds me of images of Purgatory, or the banks of the river Styx. It ties in with some of the images I remember from Eliot’s poetry after World War I. There’s something ominous that is only barely hidden under the simple and almost banal words and phrases that Millay uses to describe their world. Maybe the best example of this is the line about Millay learning to drive: when I first read it, I rolled my eyes and said “Oh, Edna, you’ll do anything for a rhyme, won’t you?” And certainly a lot of her lesser work suffers from sing-song sound patterns, and an over-reliance on bad rhymes. Here, in the context of the war and death, “I have learned to drive” seems almost comically bad, like a sudden transition from a family’s Christmas newsletter: “Bill had his right leg amputated after the accident. The twins are learning Tae Kwon Do.” But then it came to me: many women learned to drive at the start of World War II because of the anticipated need for ambulance drivers, and the need to free up young, able-bodied men for the front. “I have learned to drive” isn’t a humdrum, suburban rite of passage—it is Millay’s obligation as the citizen of a town under siege; it is her entry into a world of bone and blood. Her sitting behind that wheel is taking up her part in a cycle of violence—the man whose place she takes goes to the front, and soon he or one of his companions will ride, dying, behind her as she drives. In this compact phrase, “drive” is suddenly doing un-innocent work—it positions itself in contrast to its rhymes, “alive” and “thrive”, that precede it, taking the place of the word “death” that this poem will not speak aloud. That line won me over fast. She executes the turn from the ominous reality of the city in the octave to the more personal concern with hatred in the sestet—Millay is so good at the structure of the sonnet, maybe America’s best—we start to see that the poem is not really about the city, not entirely at least. It’s interesting to think that the real problem with war is “hatred”—the poem thus far might suggest that “dying” is war’s greatest fault. But as Millay argues, the really pernicious and evil thing about war is not death—a hurricane can kill as many (or more), and yet war is more terrible than that. I know not everyone would agree with her—Thomas Hardy, for one, never found Fate’s hands any comfort—but I see something compelling about her argument that death in the face of the impersonal induces less fear or panic than the knowledge that your end is coming at another person’s hands. The idea that we will now hurt each other, and not help, shakes the foundations of human society. There is something terrifying about the idea that any people can overcome the taboos and laws against killing that civilization has erected against the chaos and the void. War may be necessary (though Millay would not say so), but it is always about us at our worst. We have eulogized this “good war”, World War II, to the point that I think we believe it escaped being tarred by that brush. But I’ve heard the fear and the anguish in the voices of veterans who came back—I’ve seen my grandfather’s tears. And I know what stories he always stopped short of telling. If Millay does nothing else for me today, she reminds me what war feels and looks like, without giving me the image of a single bullet or soldier’s grave, and she makes me confront what war really is. Auden’s verse here is an attempt to do what the poem’s first two sections (available here, if you’re interested) have not yet done, which is to embrace the old-fashioned way in which English poetry used to act—short phrases, often end-stopped, with perfectly consonant rhymes (none of that “slant” rhyming in this section). A style that can definitely seem trite and sing-songy in the hands of lesser poets, and which Auden himself loses hold of in other works, captures here that magical incantation-like power that modern poetry sometimes forgets it can wield. The section for me is built in two even parts. The first three stanzas are an address to the Earth. What is at first an elegant instruction to the Earth as to a servant or heir—“receive an honoured guest”—becomes a meditation on the Earth as a space inhabited by violence. The dead body lies emptied of its art, and beyond it stretch the battalions of the nations, all of them ready to rain down destruction upon one another. This is a place characterized by chaos—the darkness of nightmares, the cacophony of angry dogs—and hate, which has become a rigid wall that locks out the rest of humanity. Whatever was noble or praiseworthy in the human condition, we have in some way lost access to it, in Auden’s eyes: the Earth seems beyond saving. But then the final three stanzas push back against this vision by an appeal to the poet, who, standing outside the Earth and its physical cares and limitations, still has the power to redeem us by means of art. Rather than sending Yeats off with a “thank goodness you got out when you did”, Auden draws him back to us, and sends him down to the bottom of the dark, into the nightmare-space already invoked—not to compel, but to persuade. 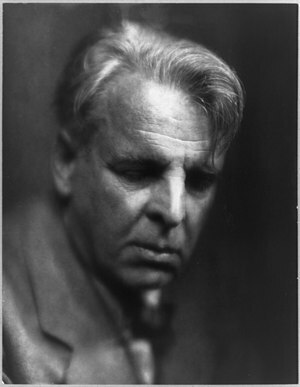 By means of his art, Yeats can still call forth joy within us. More than that, art can remake the world—Auden alludes to Genesis and the fallen Adam in the idea that humanity’s curses can be “farmed” into fruitful ground. This isn’t a withdrawal from the world’s problems into some airy-fairy happyland of poetry: he specifically names “human unsuccess” as one of the topics for singing. In making these extravagant claims, Auden is explicitly rejecting his own words from the poem’s second section, where he semi-famously remarks that “poetry makes nothing happen”—here he envisions poetry as a means of making sense of the dark side of humanity, of giving us a stairway out of the caverns into which we fall. And culminates the vision in that final stanza that is still, to me, close to perfection—the vision of a redeemed world where the gladness arises directly out of sorrow. It is not that waters will flow outwards from some lush, green place, or that the free men will unchain the bound. No, in the very deserts we inhabit there are wells waiting to spring up, and our liberty and joy emerges from that evocative “prison of [our] days”. Poetry can teach us what this means—how to look for it, and where to find it. In January 1939, Auden sees a world on the brink of self-annihilation, and mourns a fallen comrade whose strength he had relied on. But the wonder of writing, of course, is that it can endure, and that Yeats had a part still to play on Earth long after his body returned to dust. I don’t know if this poem works on you the way it works on me, or if my odes to it seem excessive to you. It may be that poetry is nowhere near as powerful as I’m claiming it can be, or as I see Auden claiming it to be. But I personally am convinced that artistry is at the vital heart of what it means to be human, and art (whether poetry or song or sculpture, or what have you) is in fact a critical factor when we consider the question of whether we can learn to live at peace with one another. This question has always plagued us, and 1939 made it more urgent, of course. It keeps me thinking, and I’m glad I have Auden as one of my muses when I do. 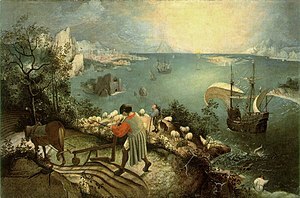 Auden is ultimately ruminating on a beautiful painting by perhaps my favorite visual artist, Pieter Brueghel the Elder*—the painting is called “Landscape with the Fall of Icarus“. But before he gets there, Auden is letting himself sink into the idea of suffering, and he does so with a simplicity of language that is refreshingly direct for poetry. He pulls back from the sufferer and the pain which blots out the senses, and sees the immense context that swallows up our most piercing moments. The tragedy Auden sees operates on a limited scale, not touching more than a handful of lives, while all around the world presses on with its business. Even the sufferer themselves is not placed in a light that bathes them with pathos, posed as though artfully arranged—no, Auden reminds us that death and pain happen here and there, in places not especially remarkable or noteworthy. He scales back the importance we place on these elevated moments of martyrdom even with the jocular, prosaic phrases and images that he turns out—dogs going on “with their doggy life” and a horse scratching its behind on a tree. He’s clearly reacting to something more than just the painting, but I wonder what: a person, or a group of people, he knows who are, for lack of a better term, “drama queens”? Or is it more of a societal problem he’s responding to—our modern tendency to melodrama in the art we revere, while the unnamed “old Masters” are held up to us as examples of a better way? At last, though, Brueghel* and his painting of Icarus are front and center, and he couldn’t have chosen a better image through which to explore his point. The Icarus painting almost lacks an Icarus—if you are viewing too small a reproduction, or if your eyes don’t focus sharply, it is easy to miss the tiny legs of the drowning man, surrounded by flailing feathers. What impresses you about the painting is the scope of the world: the sweep of the field in the foreground, the immense billowing sails of the merchantman about to get under way into a vast beyond (or else newly returned from distant shores, laden with gems and spices), and then the expanse of the sea reaching as far ahead as the eyes can travel, in the distance melding with mountains and clouds so that water, land, and sky fuse into one. I don’t know if Auden’s interpretation of Icarus is exactly what was intended by the painter, but it certainly is plausible, given the painting’s scale and where it draws the eye. There is a heartlessness to Auden’s words, but I don’t find them callous—he isn’t making the farmer and the sailors into monstrous beings. He is simply acknowledging the world that exists, both in the painting and outside of it, where failures are rarely “important” when they do not touch us closely, where the light that falls on our sorrows does so because “it had to”, because the sun (and rain) fall on the just and unjust alike. I wonder how differently Auden would have written this poem only a few years later, when the Second World War had taught the nations how universal a tragedy could be—when we all learned a new word, “genocide”, not because it was new to the human experience but because we had been forced to see the concept in a way we could not turn away from, no matter how much the plough and sail called to us. I wonder how strange it might have seemed to him to turn to this poem after the London Blitz, after Dresden, after Hiroshima and Nagasaki, when suffering had occurred on scales too great to be encapsulated in this way. I’m not saying all of this to deny Auden’s point or the power of the poem. As Niels Bohr semi-famously remarked, “the opposite of a great truth is also true”—Auden is right about suffering, and wrong. There are days when the indifference Auden describes is too painful for me to envision, because suffering is not this isolated, and the world does turn its head to look, as it should. And there are days when I need the reminder Auden gives, when I need the context in which to understand the sufferings of the world, when I need that landscape to help give a sense of order to my vision of the world. I like the poem, in the end, because it articulates a way of seeing the world that is not at all complicated, while simultaneously opening me up to some very complicated thoughts about the world. And I like it because it reminds me that I should look at some more pieces by Brueghel, who never fails to reach me. This is a good way of beginning 1938—the last of the years before the world is engulfed in war—if for no other reason than that it makes me ponder how everything was about to change (and how nothing really has). *I place this asterisk twice in my text simply to point out what can be read if you follow the links to Wikipedia’s coverage of the painting and artist—art historians now suspect, thanks to the help of technology, that the Icarus is in fact a copy (a very good copy, they suspect) of an original by Brueghel now lost, and so it’s not 100% correct to call the painting Brueghel’s. But Auden thought it was Brueghel’s (and so did everyone else) when he wrote the poem, I thought it was Brueghel’s (and so did everyone else) when I first read the poem, and to this day we don’t completely know the truth about it. 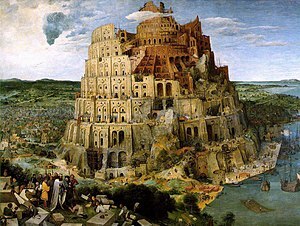 Anyway, I love the painting, and my totally non-expert eyes see it as very consistent with the work we know was Brueghel’s, so if it is a copy by one of his students, they were really good at their work, and I’m grateful the work survived by that means. "Scarlett did not realize that all the rules of the game had been changed and that honest labor could no longer earn its just reward." "Scarlett O'Hara was not beautiful, but men seldom realized it when caught by her charm as the Tarleton twins were." "To the red country and part of the gray country of Oklahoma, the last rains came gently, and they did not cut the scarred earth."